Thai Square Cuisine Galston uses their own specialised couriers to deliver their food. Marinated chicken wrapped in wonton skins. Steam chicken wrapped in dim sim paste with soy sauce. Vegetables wrapped in puff pastry. Chicken mince, potato and carrot wrapped in spring roll skins. Deep fried chicken wings served with sweet chilli sauce. Thai fish cake served with sweet chilli sauce. Chicken,vegetables and mind curry powder wrapped in puff pasty. Prawn wrapped in spring roll skins. Prawn wrapped in dried coconut, served with sweet chilli sauce. Sour and spicy soup with mushrooms and tomato. Coconut milk soup with mushrooms and fresh Thai herbs. Thai red curry with bamboo shoots and green beans in coconut milk. Green chilli paste curry with bamboo shoots and green beans in coconut milk. 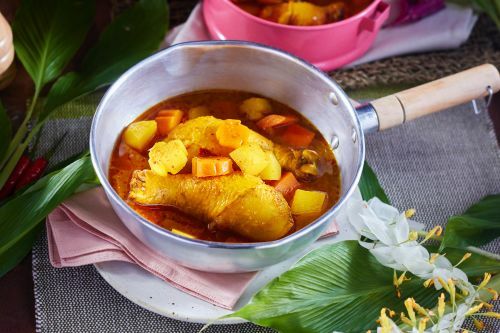 Thick curry in coconut milk with peanuts and vegetables. Chunks of beef slowly cooked in coconut milk with potatoes. Thai clear curry with corn and vegetables. Boneless duck with red sauce in coconut milk with tomato, pineapple and snow peas. Medium spicy fried rice with egg onion carrots broccoli shallot. Stir fried vegetables and cashews nut with chilli jam and oyster sauce. Stir fired mixed vegetables with chilli and basil. Stir fried fresh vegetables with ginger sauce. Stir fried meat and steamed vegetables with peanut sauce. Stir fried pineapple, cucumber, onion and tomato with sweet and sour sauce. Stir fried meat with fresh lemon grass, chilli jam and oyster sauce. Stir fried meat with oyster sauce and mixed vegetables. Stir fried mixed vegetables, garlic and pepper in homemade sauce. A popular Thai stir fried noodles dish with egg and bean sprouts. Spicy stir fried rice noodles with chilli and basil. Stir fried rice noodles with egg and vegetables. Stir fried egg noodle with egg and vegetables with oyster sauce. Original curry noodle soup with tofu and vegetables. Thai style soup with BBQ pork and vegetables. Fried rice with egg, onions, carrots and shallots. Fried rice in special sauce with egg, onions, carrots and shallots. Fried rice with onions, beans, bamboo shoots, capsicum, basil and fresh chilli.